With so many other dog health issues to consider, many pet owners pay little to no attention to the health of their dog’s paws. This is a mistake. Like any other part of your dog’s body, your dog’s paws can become injured or irritated leading to discomfort or even infection. Good dog paw care means a lot more than just clipping nails and trimming the hair around the paws. You must know your dog's paws and examine them regularly in order to understand what his paws need and how to keep them protected from the environment. I will now walk you through dog paw care basics, specifically signs of dog paw health issues, how to protect and prevent any problems with your dog’s paws. 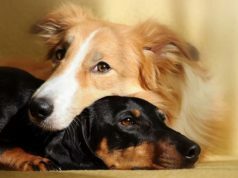 Keeping up with your dog’s paw health is a combination of routine and preventative care. Regular paw checks, adequate foot protection and routine nail trims will keep Fido’s feet safe and healthy year round. And neglecting dog's paws can result in a wide range of issues that can escalate quickly. One serious and well-known dog paw related condition is hyperkeratosis (corns, keratomas). If you groom your dog regularly, then you already do this. If not, familiarize yourself with your dog’s paws. Handle their paws gently, touching each toe, checking each paw pad. Know what your dog’s feet feel like and look like so that you will notice any changes. To check your dog’s paws for any lumps or bumps, wait until they are worn out from exercise or are having belly rubs. Hold one paw in your hand between your thumb and index finger and gently massage it. Slowly work your fingers over every inch of the paw. To check for cuts or scrapes, wait until your dog has just returned from a long walk or exercise. Then, position yourself where you can see the underside of his paws while he's lying down. Gently lift the paw and separate the toes, looking between each and checking for redness, rubbing, cuts, or foreign objects like thorns. Regular paw checks are also beneficial for desensitizing your dog to having their paws handled. This makes nail trims and paw injuries much less traumatic for both of you. READ THIS: What's the Best Paw Balm for Dogs' Paw Protection & Hyperkeratosis? Once you know what your dog’s paws look and feel like when they're healthy, check them frequently. At least once a week do a full check for lumps and bumps, as well as cuts and scrapes. I find that the easiest way to do this is during weekly grooming sessions. If you often wash your dog's paws after daily walks, then that's another good way for very quick check-ups. You should check paws after walking through rough terrain, in extreme weather, or through wooded areas or fields where foreign objects can lodge between your dog's toes. What are you looking for? Ticks, thorns, infections, seed balls, cuts, blisters, abrasions, and anything out of the ordinary. After long walks in the grass, ticks should always be your first concern. A tick has lodged itself in between the toes, which resulted in a serious infection. In summer, temperature of pavement can exceed 145° F degrees. Dog’s paws can and will burn on those very hot surfaces. Always be aware of walking surface temperatures. You can check temperatures of surfaces by holding the back of your hand against the surface for 10 seconds. When the pavement feels too hot for your feet, it is too hot for your dog's paws. Always try to stay away from pavement; keep the walks on grassy surfaces when possible. Always press your own bare hands and feet on the pavement for at least 10 seconds to check. Avoid hottest time of the day. Walk the dog early in the morning, and late in the day. When the 10-second test yields a tolerable temperature, consider other heat factors as well. Temperature of the air is never an accurate reflection of the surface temperature. Most surfaces retain heat and this temperature rises exponentially with sun exposure. Time of the day must be considered too. Asphalt starts to cool down only when the sun retreats. Protective measures like dog boots, heat-resistant socks and balms are very helpful. Many pet owners rely on air temperature when they walk their dog – if it’s too hot outside, they stay inside. This is prudent, but even when the air cools down, walking surfaces can maintain heat. 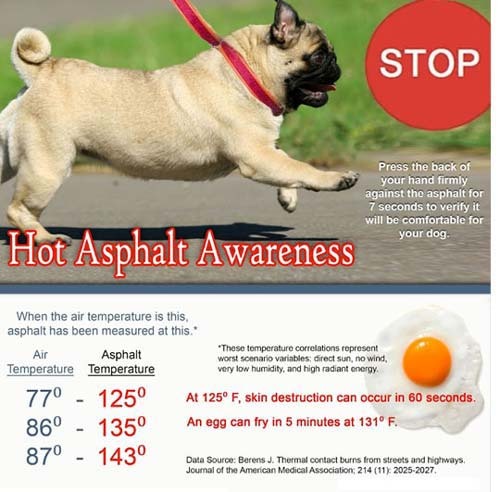 For example, when the outside temperature is approximately 75° F degrees, then asphalt's temperature will be about 125° F.
In short, if air temperatures and walking surfaces are too hot, use your common sense and stay indoors. But if the walk is necessary, then use protective measures for your dog's paws, like dog socks, booties and/or balms. When the air has cooled, the walking surface may still be very hot. To avoid the risk, you can walk your dog in protective dog socks or boots or wait until the walking surfaces cools (1-2 hours at least). While not as dangerous as extremely hot times of the day to your dog's paws, walking your pet on extremely cold surfaces can too burn or injure your dog’s feet. However, dogs are much more resistant to cold surface than we are (unlike the hot surface). In fact, several scientists in Tokyo, Japan have conducted a study (published in 2011 in the journal of Veterinary Dermatology) to understand why dogs can easily walk on ice without burning their feet. What's the answer? Turns out dog's paws have a very different system of arteries supplying blood to dog's paw pads to keep them warm in cold weather. The system acts as a counter-current heat exchanger. However, the above was only observed in wild dogs. Domesticated dogs, on the other hand, were not able to withstand the same type of cold surface as wild dogs, wolves, foxes and other wild animals. Dogs that habitually live indoors will most likely get frostbite on their paws when walking on ice for some time. If sidewalks are snow-covered or incredibly cold, invest in a set of protective dog boots. If sidewalks are iced, avoid walking on them – both you and your dog could sustain injuries. If sidewalks have been de-iced with salt or other chemicals, avoid walking directly on them or ensure that your dog is wearing protective boots, socks or other gear. Many chemicals and salts used to de-ice sidewalks are dangerous to your dog if they lick their paws after walking on them. If you enjoy hiking, spending a lot of time outdoors, camping, cross country running, or similar outdoor activities, then you know that extreme territory can be dangerous. Sharp rocks, hard to grip surfaces, and the potential of stepping on all sorts of wildlife can all result in injury to dog's paws. Remember that your dog's paws are NOT tough to begin with. Many pet owners think that dog's paw pads are equivalent of shoes, which could not be further from the truth. This is especially true for dogs that habitually live at home and rarely spend time walking on rough terrain (occasional hikes do not count). The very first thing to consider before going outdoors for any type of adventure with your dog is that the trip must be short if your dog is not yet used to walking on any surface other than pavement and grass. A known backpacking website REI.com has a great article on how to protect your dog in these cases. The best two ways to protect your dog's paws from damage done by rough terrain is to invest in a set of good quality protective hiking boots and/or try one of the protective paw balms. Usually, dog boots will be much better if you find the right fit. This is where regular dog paw care check-ups are important. However, if you failed to notice something well in advance, your dog will let you know when the problem escalates. If you notice your dog limping, licking his paw(s), failing to bear weight on a paw, showing signs of pain or discomfort, or showing physical signs of injury, address the situation right away. Since your dog uses his feet constantly, any injury to the paw or paw pads can escalate quite rapidly due to irritation or infection. For small scrapes or cuts on your dog's paws use anti-bacterial dog wipes or antibacterial spray, and cover with a pet-safe paint-on bandage. This will protect the paw wound and allow it to begin healing. For any scrapes or cuts of large size, it’s always best to drop in and see your vet as soon as possible. 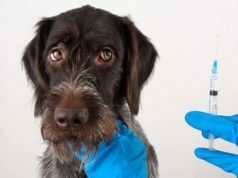 When you notice any irritation, infection signs or rashes on your dog's paws, it’s important to get to the root cause as well as to seek out your vet for an appropriate treatment before the problem escalates. Usually, antibiotic treatments, steroids, or cortisone creams will be prescribed by your veterinarian. The bottom line is: know when to seek veterinary attention for your dog's paw care. 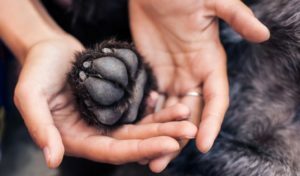 Paws and paw pads are constantly being aggravated, so it’s important to know when to seek attention from a professional for any of your dog's injuries or wounds. The general rule of thumb is that anything more than a small cut or abrasion should be seen by a veterinarian. This prevents more serious concerns from compromising the entire foot. When addressing smaller pet paw concerns at home, it’s important to use only pet-friendly products. While some over the counter human topical antibiotics (like Neosporin) are safe for dogs in general, the concern is that they will cause stomach upset if your dog licks the product. This worry can be avoided by using dog-appropriate health supplies. Alternatively, you can try sealing safe human topical antibiotics underneath pet safe bandages so they cannot be consumed. You can also use a cone collar (the cone of shame) to prevent licking if you use human topical treatments on dog's paws. Remember that you must have most of the essential dog health supplies in your pet first aid kit at home. Some pet owners are also intimidated about treating small wounds on dogs, but you shouldn't be. If you need some basic explanation on a few aspects of it, watch our video on how to clean dog wounds. Speaking of pet-friendly dog supplies for a variety of health issues, there are a few items that are specifically designed to either protect your dog's paws, or deal with paw problems. Here are some of them. Taking care of your dog's paws is more than just knowing a little bit of first aid. There are a few dog paw health products that you should always keep with your canine first aid kit in order to protect your dog's paws from injury. You know what they say, an ounce of prevention is worth a pound of cure. Paw balms protect dog’s paws against various extremes including cold surfaces, hot sidewalks and sand. There are several brands of paw balms, but one of the most popular choices of doggy paw balm is Musher’s Secret which is made with 100% natural waxes. These waxes create a protective layer over the paw pads to protect the paw without hindering movement the way protective boots might. Here are some alternative balm brands. Paw balm is easy to apply, provides a breathable surface for the foot, provides free movement of the feet, moisturizes the paws and works on a range of surfaces. Unfortunately, paw balm can be messy to apply, sometimes needs reapplication depending on walking surfaces and requires cleaning your dog’s feet after walking. 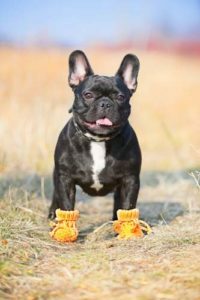 There are dog boots that are designed to protect a dog’s paws against all extremes, both summer heat and winter cold. They are most often used in cold temperatures and on awkward terrain, however. They can be used on hot surfaces, but the heat of the boot itself can cause overheating. There are a few different varieties of boots, but the most trusted brand currently are Ruffwear. Mesh dog boots can provide cooler protection during warmer temperatures. Solid sole dog boots provide added protection for dogs who hike frequently and additional grip on slippery surfaces. Soft rubber soled dog boots can offer indoor traction for older dogs who have trouble walking. Soft fabric soled dog boots offer little durability and should rarely be considered for anything other than the application of medication or moisturization. Dog boots offer complete protection for your dog’s feet and come in a variety of designs for different uses. Boots also require less effort to take off your dog in comparison to paw balms. Many protective dog shoes are often difficult to put on and if not fitted properly they can come off or rub your dog’s feet. Quality boots are also quite expensive. Dog boots can also cause feet to overheat if used in hotter temperatures. If you need help on fitting dog shoes onto your Fido, watch the below video (or read the guide). Paw moisturizers are often used for dogs that get dry and cracked feet or noses. Just like human moisturizers, these products replenish the moisture on your dog’s paw pads and make them suppler. There are many paw moisturizer brands on the market. The brand you select is up to you, but I recommend discussing this with veterinarian and/or read reviews from other pet owners on their effectiveness. I find that it’s always best to go natural, however. If you need suggestions, try using a moisturizer from Burt’s Bees, Dr. Harvey’s or Natural Dog Company – all of these brands use natural ingredients in their concoctions. Each dog paw moisturizer comes with instructions individual to that product. Most often this involves massaging the cream into your dog’s paw pads and covering the paws with fitted socks to allow absorption. If you notice your dog’s paws looking dry or beginning to crack, it’s a good time to start using a heavy-duty dog paw moisturizer. This happens for most dogs during winter months when walking surfaces are colder and feet are exposed to ice melting salts. Paw moisturizers can also be used as a preventative once a week, but this is not always necessary. First aid spray or lotion can be used at home anytime your dog gets a small cut or sore on your dog's paws. It’s preferable to use sprays over lotions, as they dry much faster. Try to avoid sprays that contain alcohol as they can sting. When purchasing first aid spray for your dog’s feet you can choose between all-natural remedies and traditional remedies. Most pet owners choose traditional remedies like Vetericyn which is available from pet stores. The different antibacterial solutions come with instructions individual to that product. Most often this protocol involves applying the antibacterial solution and covering the wound to prevent licking. I have found that the best way to protect wounds is by using a pet-friendly liquid bandage. The liquid bandage simply sprays on top of the antibacterial solution and it has a bitter deterrent to prevent licking. When covering a wound, you can also use a traditional bandage, but this is usually more difficult to keep in place. Lastly, some pet owners simply choose to put their dog in an Elizabethan dog collar during the period of recovery to prevent licking of their wounds. If your dog has a small scrape or cut that does not go too deep into the paw pad, you can use at home antibacterial solutions. If your dog has a deep cut, a wound that is bleeding heavily, a puncture wound, a split paw pad, or significant damage to the paw pad – you must seek veterinary assistance. I would like to close this with a quick note: it’s important for us to talk about regular paw maintenance because many pet owners forget it. The most important aspect of dog paw care and maintenance is to regularly check the paw pads as mentioned previously. Additionally, it is crucial to keep up with regular nail clipping and trims. When your dog’s nails grow too long they can curve under and grow into the foot causing your dog pain, bleeding and lameness. If you have never cut your dog’s nails before or don’t feel confident in doing it yourself, simply go to your vet, but we also have a step-by-step guide and a video on how to cut your dog's nails safely. Most vet clinics will trim your dog’s nails for a nominal fee. If you are interested in learning how to cut your dog’s nails yourself, ask your vet to show you how. Just don’t assume that cutting your dog’s nails is like cutting human nails. The structure of the nail is unique and clipping too close can cause heavy bleeding.